Have I mentioned how much I love my new backyard? I love my new backyard. Who takes on landscaping projects in the dead of winter, you ask? Us, apparently. Though I would point out that yard work in the middle of a Central Valley winter makes a lot more sense then yard work in the middle of a Central Valley summer. 50ºF or 100ºF; you choose. What we wanted was something that didn't waste water. Something that had room for vegetables. Something that didn't require loads of maintenance. Lawns, in my opinion, are stupid. The only thing we ever did with this tiny lawn was mow it (and not often at that, as you can see) and curse the nasty little biting bugs that lived in it from April to June. Beyond that, in a climate like ours, I can't view default home lawns as anything but criminally imbecilic. There is a big beautiful community park around the corner with lots of grass for sports and frolicking. Here, we wanted tomatoes and entertaining space. I’m throwing this word “we” around a lot. Let me clarify. Shawn did 95% of the work outside in the rain while I kept Luke from getting too much under foot and sat glued to the TV watching Buffy the Vampire Slayer. (I was in the middle of season 2 and it was the end of the world; what else can I say?) I’m a horrible human being. But an honest one. Well, I did some stuff. I did garbage cleanup. I organized the mounds of crap out behind the garage. I orchestrated a rock river, picked out cabbage, held posts upright, and moved ferns. I selected the bird bath. Speaking of, you wouldn’t believe how hard it is to find a bird bath that doesn’t already have little stone birds on it. Dude. If you build it, they will come. But, really, this is Shawn’s baby and he gets the credit. He did a beautiful job. So here we are. It’s January and it’s cold, but we’re out there anyway, swinging in our new sky chair and watching the string beans grow. I spend a lot of time standing at the back door on cold mornings holding my tea mug and looking at our new little paradise. I can’t wait for the roses to bloom. When the weather gets warm, you can all come over. We’re due for a barbeque. 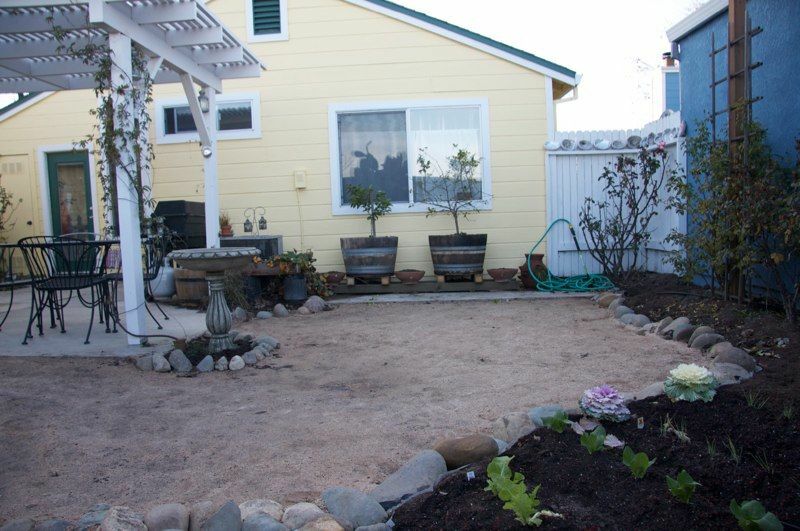 The full photo gallery of the backyard process is here.